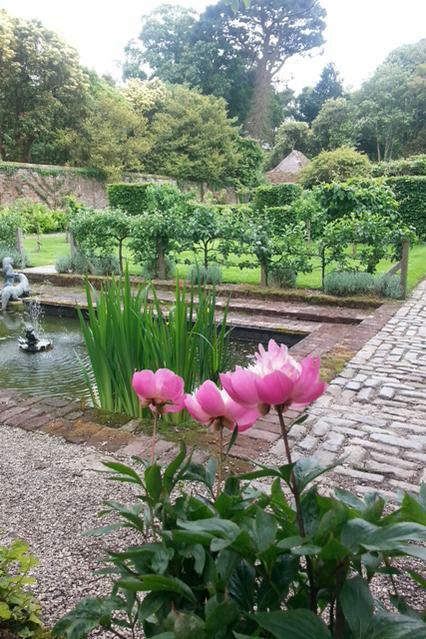 Trewithen’s elegant walled garden will be open to the public for the last week in June. Normally used just by the Galsworthy family who have owned the estate for the last 300 years, it’s a rare opportunity to experience this horticultural gem at its best. A central path runs through the garden from the family’s entrance in the east wall, continuing as stepping stones over a lily-filled pool to an arch of semi-circular steps at the west end. The main body of the garden is a lawn with Hornbeam (Carpinus betulus) hedges dividing it into “rooms”. Fruit trees fan over the walls and an old fig tree, famous for its harvest of large fruit, grows in the north eastern corner. The north facing border is planted entirely with shuttlecock fern whilst the one to the south has a repeating sequence of low flowering plants in soft purples, blues, grey greens, silvers and soft yellow. The two west facing borders are a mass of peonies in white and all shades of pink with violets along the edges. “The walled garden has an innate sense of balance and proportion which gives an immediate and overwhelming sense of peace,” said Trewithen Head Gardener, Gary Long. The walled garden will be open daily from 10am to 4pm.